Static shocks are something we are all familiar with, whether it's from touching a handrail while going up some stairs or as a youngster sliding on the front room carpet to touch your siblings arms to give them a shock! While the shock in most cases is irritating rather than long lasting, in an office or laboratory setting, such shocks are unpleasant, disruptive and in some cases are a hazard to employees, work productivity and equipment. Happily, there is something that businesses can do to reduce the impact of electrostatic in the office or lab... ESD chairs & seating. Electrostatic Discharge (ESD) is the sudden flow of electricity between two charged objects. Caused by contact, an electrical short or Dielectrical breakdown. It is hard to believe that we can be an electrical hazard in the workplace. The truth is we are all organisms of built up electrical charge. Sometimes when that charge is discharged it can have dire consequences to the running of your business. For example electrical components which obviously include your computer systems, flammable liquids, gasses and so on. Whilst it is harmless to us, a lot of energy goes into these little sparks: it takes more than 3000 volts to feel, 5000 volts to hear, and 10,000 volts to see a discharge. There is only one way to prevent these problems occurring and that is for companies to invest in the right type of equipment, furniture, seating, flooring and so on. Sometimes an entire area needs to be ESD free in that case the areas would be defined as electrostatic protected areas (ESA). Having ESD equipment in an office, warehouse or high risk workplace is crucial to the safety and operations of any company. Making sure you protect your products and employees is paramount. Thankfully there are products available that do make the workplace safer and one of the easiest to introduce is ESD chairs. A typical swivel ESD operator chair will dissipate electrostatic charge from the user by providing a conductive path from the part of the body that is in contact with the chair to the ground. This is possible in chairs with Hi-Tech fabric because the fabric has conductive fibres woven into it. For chairs that are not fabric but with a vinyl covering, ESD vinyl is ideal. The vinyl is manufactured with a thin conductive layer below the surface of the vinyl (1 mm thickness of mica is 60kv or 60,000 volts ). Office and lab chairs are not generally fitted with ESD as standard, particularly those from big retail outlets. Our ESD chairs are manufactured in the current ESD format; Standard with a chrome steel base and gas lift; Earthed from the backrest to the seat mechanism & grounded via the conductive castors or glides. We also offer a good choice of ESD fabrics including Camira high tech, a high performance fabric available in nine colours and Medistat another high performance material but in a black vinyl. 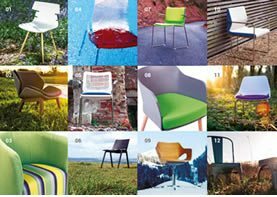 ESD is available on many of our seating ranges including: Blade, Cassius, Folly, Grande Plus, Jumbo, Lombare, Montel, Napoli, Petite Plus, Santino, Industrial Pu and Mon Pu. 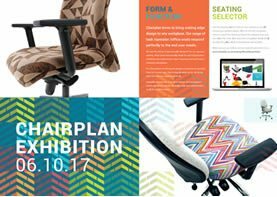 Contact our sales team here at Chairplan for any further information.